CAPE CANAVERAL, Fla. — The final crew of NASA's space shuttle Endeavour has been through more than most. The five astronauts who will be under the command of Mark Kelly on Endeavour's final mission were shocked to hear in January that Kelly's wife had been shot in the head. Rep. Gabrielle Giffords, D-Ariz., was meeting with constituents outside a Tucson grocery store when a man opened fire, shooting Giffords and 18 other people. Six died, including a federal judge and a 9-year-old girl. "Gabby is looking forward to some time away from the rehab center & the chance to see @ShuttleCDRKelly launch again," Giffords' office wrote in a Twitter update, referring to her husband via his Twitter moniker. The attack was devastating to many, especially Kelly's close-knit crew. Endeavour pilot Greg H. Johnson recently recalled everyone's reaction to the news. Johnson said his 13-year-old daughter had become especially close with Giffords, and news of the shooting that Saturday, Jan. 8, shook her. "Initially they thought she [Giffords] might have died, and she was just completely distraught, but then there was hope when we realized she was still alive," Johnson said. Johnson is second-in-command of the crew, under Kelly. "That evening, as Mark's pilot, I kind of took the lead and stood in for him, got everybody over to my house, their spouses, their kids, and we had a get-together to deal with the initial shock, the emotional shock, but also to come up with a game plan on how the next few days were going to proceed," Johnson recalled. "So that was a good meeting, we brought all the families together and gave each other support." Johnson continued to help lead the crew through the difficult days that followed, while Kelly was away to be with his wife and family. "Once we got back to the office on Monday morning, I was meeting with the management and we figured out how we could continue the crew training while Mark was in Arizona, because we knew he'd probably be there for a while," Johnson said. NASA soon decided to appoint a backup commander to stand in for Kelly to allow the crew to continue training. It was not yet decided whether Kelly would ultimately give up his spot on Endeavour's flight or re-join the crew. Veteran spaceflyer Rick "C.J." Sturckow, who was serving as deputy chief of NASA's astronaut office, took over as backup commander Jan. 13. "C.J. didn't come in and disrupt what we were doing as a crew," Johnson said. "He recognized that we were a pretty well-tuned machine at that point, but he did offer mentorship and his expertise and he helped us train. But he stood a little bit out of the way. He didn't try to rock the boat and change course immediately; he let us run as we had been running and make decisions individually inside of the group instead of overriding us." In early February, Kelly announced he would rejoin the crew and fly with Endeavour. 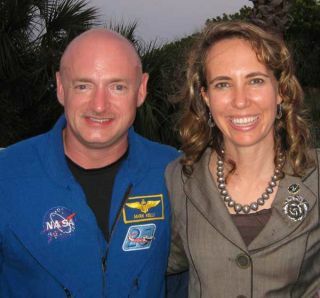 Giffords was doing so well, he said, that he felt it was all right to launch on the shuttle as planned. He resumed training at NASA's Johnson Space Center in Houston Feb. 7. "We weren't sure Mark was going to be able to come back, even up to the very end," Johnson said, "but when he was able to come back, of course the crew was very happy to have him back, and he stepped right in where he left off." Overall, the ordeal was harrowing for every crew member, though the astronauts relied on their long training to focus on the mission at hand. Kelly, as a captain in the U.S. Navy, had particular experience pushing his emotions to the background while working on a challenging task. Johnson said: "Although it's been a complex and difficult situation as we've continued training these last few weeks, Mark has compartmentalized his personal issues. With the crew, he's continued to be our leader, and I think as a crew we're in a nice place." To show their support for Giffords, each the STS-134 astronauts has taken to wearing a blue rubber bracelet with a peace sign, a heart, and "Gabby" carved in them. "They remind us of Gabby and her recovery," Johnson said. "She's doing better every day, and so we're hopeful that she'll continue to do that."